So here's the deal. Uncle Tony (my mama's sister's husband) who is 80 sumptin' years of age, asks my mother for my phone number. She gives it to him, knowing that I may get 1,2.3, or perhaps, 453 calls in one day. Soon enough, I get a call and I see the name on it. I couldn't answer it because I was on a Skype conference call at the time. I thought, well he'll leave a message or something. But no. He kept calling and calling again and again. On the 5th try, he finally did leave a message for me. When I called him back, he wanted to know what kind of computer I gave my mom. "It's a Macbook, Uncle Tony. You have to go to the Apple Store or Best Buy to purchase it." "I only want it so dat' your aunt can call ya' mutha up - so they can see one anutha' on dat' ding dare'." "I don't know. Can't they see each other on video and talk at the same time?" "Yes, but she doesn't need a Macbook. She can get a $50 refurbished computer at BJ's for what she needs it for." "No! No! No! I want exactly what ya' mutha has! I want the same one so they'll be nooooo problems! Listen to me doe' -- how can I pick up da' computer and make a phone call?" "Uncle Tony, call me when you have the computer. Maybe I'll swing down to Brooklyn and show you how to use it." So, I didn't hear from him until a few days later. I received a voice mail message. So remember, I told him that Mom has a "Macbook", but he got it all wrong. He wants to know if he needs the computer that he bought with the book on the Mac. So he has the book, but not the Mac. God help me. Watch below. Click here if you're not able to view the video. 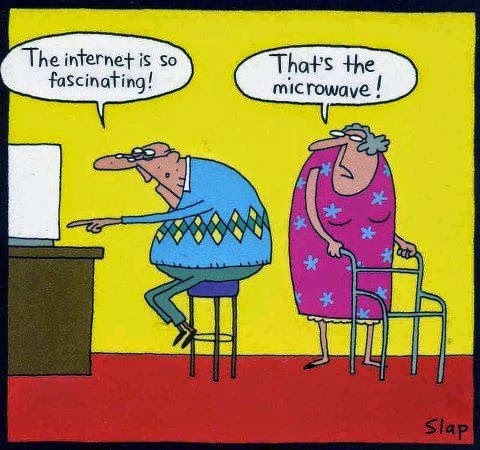 Now that my mother's getting pretty savvy with her computer and internet skills, she now giggles over what her sister and brother-in-law are struggling with. She no longer calls Google, "Goggles" and refrains from referring to Twitter as "Twatter" and "Tittles". It's no longer a "blacktop" but now, a laptop. She's come a long way. Now please pray for me once my uncle is finally up and running with his computer. He also did not realize that he had to call his cable company to hook him up with the internet itself. "Doesn't it have the internet on it already?" "No. The service is provided by your cable company." I need more medication for this next call which will be recorded for entertainment purposes.